LEWIS FRAMPTON capped a memorable snooker season with a 4 - 1 victory over PAUL BUNYARD to win the Snooker Championship at Chertsey SS & NR Club tonight. LEWIS had already won the Snooker Handicap and recorded the seasons highest break with a 101 in a league match against Staines. The snooker double has only been accomplished twice before in recent seasons both times by MARK LEONARD in 2000 and 2003. LEWIS has strong claims to be player of the season following this success. He settled first with a 47 in frame one and took advantage of a subdued opponent who was uncharacteristically slow to find any rhythm. LEWIS pressed home his advantage with a comfortable win in frame two and after looking second favourite throughout the third frame managed to make it 3 - 0 with a black ball victory. PAUL, with his back against the wall, made his best break of the night, a 69, after LEWIS had got in first with 26 before missing a straightforward black off the spot. The fifth and final frame was nip and tuck but keeping his game together well allied to PAUL's unfortunate run at crucial times, LEWIS eventually potted a superbly struck long blue to leave PAUL needing snookers. PAUL was gracious in defeat and felt that although the run favoured LEWIS he didn't make the most of his chances and LEWIS deserved to win. For LEWIS his name goes on the cup and in the record books and at only 20 this big win in a period of outstanding players in the Byfleet League is a notable achievement. Hopefully he will continue his progress and show good form for many seasons. The hallmark of previous multiple league tournament winners. Frame scores; LEWIS first 78 - 36 (47), 69 - 9, 65 - 64, 30 - 74 (69), 71 - 41. Thanks to Chertsey SS for use of their snooker room. To Terry Teeman who did an excellent job refereeing the final and to Jim Angus for assisting Terry with the scoring. 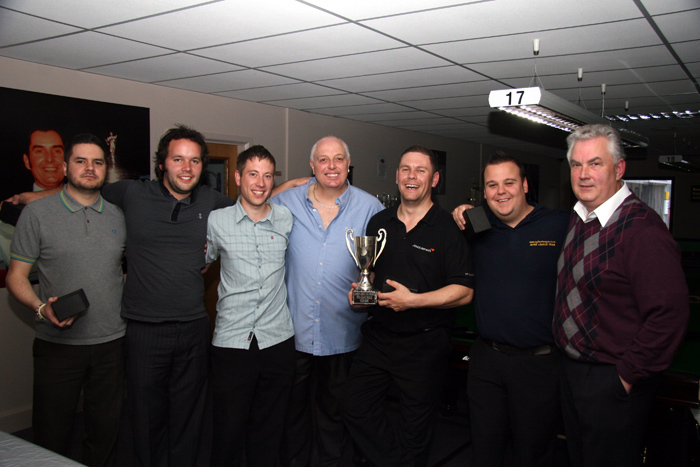 LEWIS will be eligible to represent Byfleet in the 2015 Champion of Champions tournament for which PAUL BUNYARD is the reigning holder.